This is a really beautifully digitized design from the OSAWA FISH COLLECTION DESIGN CD – available at your local ELNA dealer. BUT….how do I get this design off the CD in my computer and onto my embroidery machine to stitch out????? The information here will be applicable to the following Elna embroidery machine models: EL8200; EL8300; EL820; EL8600; EL9500 & EL9600. First thing to consider is: What does your machine model have in terms of transferring designs from the computer to the machine: Does it have a cable to directly connect? Does it have a USB port on the side of the machine? Does it have an ATA card (or compact flash card) port on the side of the machine? Some models have more than one option such as the EL9500 which has cable & USB or EL8300 which has ATA and USB ports. If you are trying to find a blank ATA/Compact Flash card, please contact your local ELNA dealer as you will probably not find this at the electronics store. If you are going to use a USB stick: PLEASE do NOT use one larger than 1GB or 2GB. If you try to use an 8GB or 16GB one, you will more than likely run into difficulties. Trust me on this! These small capacity sticks are pretty hard to find so feel free to contact George at Stitchitize in Saskatoon who has a supply of small capacity USB sticks for purchase that he has had made specifically for our machines. The link to his website contains Tel as well as email address. If you have the EL9500 or EL9600, you will have a cable that was included with the machine which can also be used for transferring designs. One end plugs into your computer and the other end plugs into your embroidery machine. FORMAT the stick or card by putting it into the embroidery machine and then go to the SET menu. If you do not know where the SET menu is on your particular Elna model, then you need to read your Instruction manual and/or go to your local ELNA dealer for some lessons. The SET menu is where you go to adjust numerous settings on the machine and you really do need to know where to find it and how to make adjustments to your settings. So, scroll through your SET menu until you find FORMAT. Select the memory device you intend to format. The sewing machine icon will erase everything in the saved memory of the machine & return it to factory default settings. (Relax – you will not lose the built-in embroidery designs – they cannot be erased). I rarely, if ever, touch this as I usually need & use all my adjusted settings. Another option is to format the USB or ATA card (or both) depending on what model you have. Select the applicable option. 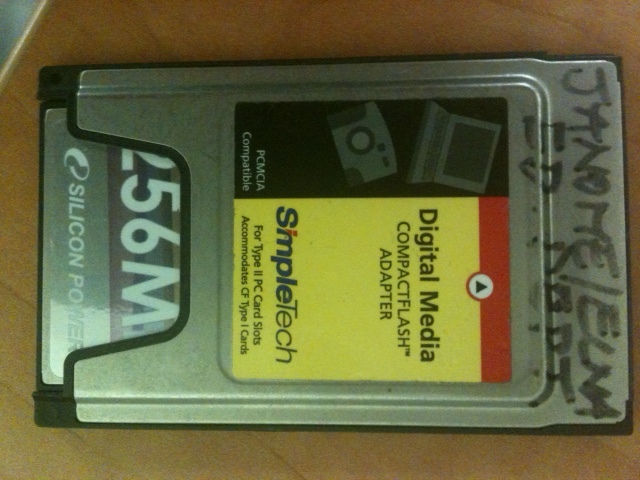 Another piece of valuable advice is this: the formatting process will erase all the data saved on that stick or card. So I highly recommend you move any files or designs from the stick/card to another place on your computer if you do not wish to lose these files forever! Ensure that either the stick or card is empty or only contains things you do not mind deleting. Once you are ready, press OK. There may be a light flashing on your stick to show you something is happening – this depends on the stick. You will notice a message on the screen of your embroidery machine which warns you NOT to remove the USB stick/card or switch the machine off until the formatting process is completed. You would be wise to follow this warning or the formatting process will not be completed correctly. Once completed, remove the stick/card and put it into your computer. If you go to MY COMPUTER, you will now see some file folders: Emb; Embf; Embf5; My Designs, etc depending on what model you have. It is important to note that there are TWO file folders- one inside the other one. PLEASE BE SURE TO PUT ANY DESIGNS YOU WISH TO OPEN & STITCH AT YOUR MACHINE INTO THE INNER FOLDER. A word about ATA/Compact Flash cards and newer computers: If you are using a newer computer, chances are that you do not have an ATA card slot somewhere on your computer. You should , however, have a USB port. Your local ELNA dealer will be able to sell you a transfer kit that includes the USB connection for your computer on the one end and the reader/writer box for the ATA/compact flash on the other end. Please contact your local Elna dealer for more information. It is rather doubtful that you will find this equipment at the electronics store but we usually have them in stock to supply to your local ELNA dealer. FURTHER IMPORTANT INFORMATION: Try to avoid storing your saved designs on your card stick or embroidery machine built-in memory. What this does is clutter up the memory space just like when you jam too much stuff into a closet or drawer! Rather reserve your built-in memory on the embroidery machine just for designs you are currently using & then delete them when you are done. Same for your stick or card: use it for transferring designs rather than for storing. My strong recommendation would be to store your designs on CD’s. Just add these CD’s to the collection of the ones you have purchased. I have a nice sturdy shoe box on my bookshelf in which I keep all my CD’s. Then when I need a particular design (or maybe I am just looking for something suitable to embroider) it makes it so much easier to find. If you do not already use the DESIGN GALLERY section of your JANOME/ELNA DIGITIZING software, you might like to investigate this & find out how to. It makes it so very much easier to look at & find designs you need. So, to review #12 > Save your designs onto your stick or card to use in the machine. Keep the card/stick mainly just for transferring and not as a storage device. But be sure to save your designs on your computer and/or burn a CD for storage purposes. This is a rather wise idea as you will then have a back-up if anything should happen to your computer – it could get stolen or more likely it might crash. Ask me how I know??!! If you have a cable for your machine (EL9500 & EL9600), check out the Instruction manual and follow the instructions there for transferring designs. Or arrange a lesson on how to use this cable with your local Elna dealer . This method works best if you have a laptop which you can position near the embroidery machine or you have your embroidery machine & desk top computer set up next to each other in your sewing room. If not, using a USB stick for transferring designs is probably an easier option for you. Please note that there may be slightly different ways of doing the things I have explained above. These are just the methods I use and they work well for me. PART 2 COMING NEXT MONTH ON 11 MARCH – WATCH THE BLOG. If you require further information, send us your query in the Comment box below or contact your local ELNA dealer. This entry was posted in EL820, ELNA IN CANADA, EMBROIDERY PROJECTS WITH ELNA and tagged Transferring designs from computer to Elna embroidery machine. Bookmark the permalink. 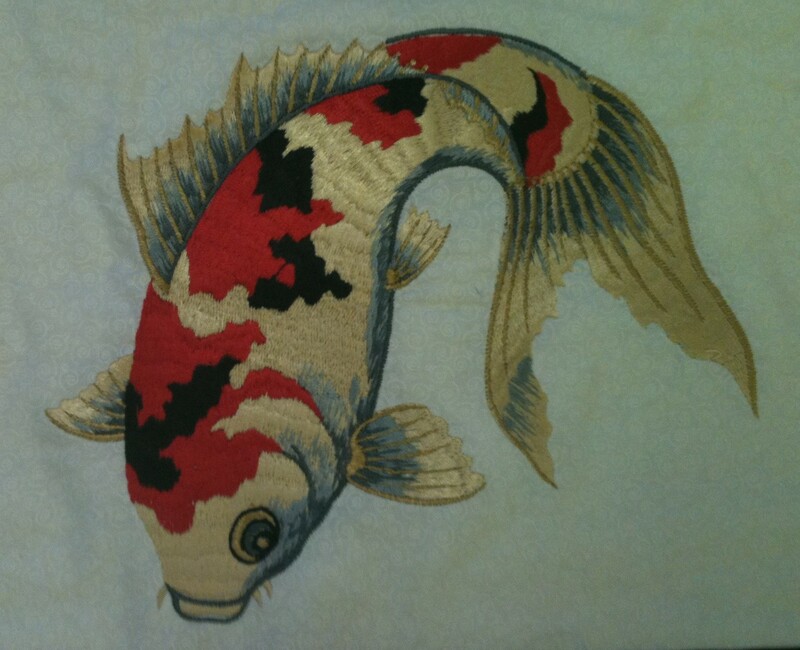 I am having problems getting my Elna 8300 to read designs made on Embroidery Works software for Mac. I have checked the format and it is jef, the hoop sizes are correct, and other designs downloaded on my Mac have worked as long as I don’t use the Embroidery Works software. I’m thinking it is a language issue between the software and the Elna. Any advice would be great! Please read this blog post again and check that you ARE indeed creating those folders Emb & My designs on your USB stick in the set menu of your EL8300. Then put the designs inside the INNER folder. If you do not do this, the machine will NOT read the designs. Sometimes a stray stitch is outside of the hoop and that prevents transfer so check for these by enlarging your screen to see that everything is inside the hoop. You do not say what design it is nor how many stitches & colour changes there are. This too can limit your ability to transfer designs as there are maximums for both of these. Please check this too. I am not sure if the Embroidery Works software or the Mac is causing issues. We do not support Mac and I do not know anything about Embroidery Works software. We only support our Janome & Elna software – sorry. You would need to consult the dealer or company who supports this software for further help. You could contact your Elna dealer or our Embroidery Software Helpline (find the contact information on either the http://www.anome.com or http://www.janome.ca websites). This helpline supports all Janome & Elna owners in North America who have queries. You will need to wait a while for a reply. It will not be instant. Thank you for your help. I have someone at babylock looking into the problem. It looks to be defective software CD, afterall. I love my machine and have had a blast using designs downloaded. I’ll get this problem sorted out and be able to merge designs and create my own monograms. Such fun! I have an elna 940 can not transfer designs from PC to machine. Not sure if the machine is set right. When I go to the screen that set 3 that shows the formats I select the third one is this right? a pop up comes up telling me I will lose my designs it will not let me do anything but exit out. I am using Sea What Pro program and I know it will work a friend uses it with her Happy Machine. I am unfamiliar with the Elna 940. Is this a brand new machine? Where did you buy it? I do not believe we have this model in Canada so I am not really able to help you. If you recently bought it from an Authorized Elna dealer in another country & it is a brand new machine, then they really should be the place to go to have your questions answered and to get your lessons on how to use your new machine. I can tell you that when you format the USB stick ( I am assuming that is what you are referring to?) that , yes, all designs currently on that stick will be erased. Similarly, if you format the builtin memory of the machine, you will lose any designs you had saved there. Sorry, I cannot help you with the Sea What Pro program. I know nothing about that program. I also cannot comment on the compatibility with your friend’s machine other than to say that because it works on one machine does not necessarily mean it will work on another as different brands of machines operate differently and use different formats etc. We recommend you deal with your Elna dealer and get support and training on how to use your machine from them. I am having serious problems with my Elna 8600. This is what I am trying to do: I have a 64 scan disk card that the machine will NOT format. The messages are as follows: Insert ATA PC Card (I did) Fat error in the card Do you want to format the card Error occurred while processing. We have done everything……. but cannot go any further. Can you please help us? Is the 64 referring to the size of the ATA card? 64MB? or what? Size is important though that older technology (ATA cards) was usually smaller in capacity so this should not be an issue for you in being too large a capacity. 64MB is fine. You really cannot use any device larger than 1 GIG in that EL8600. It will not read that large a capacity card. 1. Have you formatted the card in the COMPUTER to try to reset/erase any corruption etc? You would need to remove any data you do not wish to lose first. 2. THEN try formatting the card in the machine again. If it still will not format it, & allow you to use the card, then it may well be that the entire card has become damaged or corrupted. (same thing can happen with USB sticks from time to time). You will then either need to purchase a new card/disc OR you could call our software helpline for other suggestions in case there is some other way to make your card “behave”. Call 1-800-631-0183 Ext 775. Please allow some time for a reply as they will be banked up due to the holidays. I had selected to download them in “.JEF” format onto my laptop. The download was done in the 1-click download mode. I even tried to download them as ‘unzipped’ but without success. From there I copied them onto my stick. (The stick was formatted in my machine and the files were copied to the ‘inner’ ‘embf’ file. However, when I put the stick into my machine I get the message that no files are detected. What can I try to get the designs opened on my machine? Where did you buy your EL860? Your dealer should be the one showing you how to transfer designs and operate your machine. This blog comment page is not set up to offer detailed, specific information to individuals. The EL860 is the same as the Janome MC9900. I am not sure what designs you are referring to? Are they maybe larger than the hoop size on your machine? That could be one reason. Also what size USB stick are you using? You cannot use one larger than 8 gigs. Your EL860 cannot read large capacity sticks. Try one 8 gigs or less. I do believe the very best thing you should do is go to your local Elna dealer where you purchased the machine and ask them to show you the steps. It could be that you are missing one small thing? Sorry, I could not be of more help but it is limiting when I am not able to actually point to things on the machine & computer. i am having problems with my machine reading my usb stick, i have been using this machine, elna 820 for 2 years now and haven’t had any issues until now. i drag and drop as always, it shows on the stick it is there and when i put it into the machine it won’t show me anything, pleeeeaaase help me. Mmmmm…not sure why you could use & now not. What did you do that was different? You do not mention what designs you are trying to use this time? Are they too large for the hoops on your EL820? Are they the correct .jef format? Other than that, I really am not sure unless your stick has become corrupted – it does happen. Have you tried using another USB stick to see if maybe the one you have been using is damaged? Your local Elna dealer might be able to help you too. My elna xperience needle suddenly only moves in one line from left to right. Did I do something wrong or is it broken. Please help. Hi I have An Elna 8300 And I love it but I am interested in getting Cd drive To use instead of the USB does it matter what type of cd drive or do I need software, or will it work at all ? Would you be available to assist me with my machine? I purchased it second hand and I am new to embroidery and I am not able to make the stitches correctly. Jef. Files that I have from CD? If so does it need to be a special type? I use Sew- Whatpro as my conversion program on my computer. No, you cannot hook up the El8300 to an external CD drive. This machine does not have that capability. Please use a USB stick to transfer your designs from your computer to the machine. Hi, hoping someone can help me, I recently bought the Elna emb81 and would like to know if I can transfer deisgns onto a memory stick to I can sew them, and if so how do I do it. Im totally new to this kind of machine. Ive bought a disc with the jef format designs. I am sorry but I do not know the Elna emb81. I do not believe it is a model we have had in Canada. Sorry. It would be best you contact the supplier who sold it to you for lessons and support. Not sure if you mean JPEG? Or pes format? Yes, you can convert embroidery file formats to be compatible with your machine which is .jef. You would need an embroidery software package in order to do this. I have a 9020 with a serial VGA cable how can I connect to the internet without the Elna software it’s not sold anymore. Help please! I am not familiar with that model number. Please contact the Software Helpline at 1-800-631-0183 Ext 775. I have a Elna 8300 and need a slide bobbin cover plate. Any idea where I can get one? I’ve just bought an Elma 8200, and am trying to understand what kind of ATA card to use for downloading .jef files. Is a normal SD card acceptable to use? Can micro cards also be used? Sorry for the delay. I have been on the road in the US and Canada. The ATA card or PC card is an older technology. If you google images of ATA card’s, you will see what they look like. No, the little SD card for camera’s will not work. Not sure what you mean by a micro card but I doubt it as I ahve not heard that term in connection with our machines. Try Janome/Elna America through your local Elna or Janome dealer in case they still have inventory of ATA cards etc. I know we do not have nay in Canada. Sold out long ago, sorry. Yo can also google it and see what you can find online. DO be very sure you have a way of getting the ATA card into your computer. Most newer computers do not have the slot for this card so you may need a reader/writer box that is compatible with both your computer and the ATA card. We would love to be able to help you but sadly we cannot. That machine model is not known to us here in North America. We think it may be from before our days of manufacturing Elna. The best is to ask your local Elna Dealer or the Elna distributor in South Africa. 1.Can I update the Digitizer to the newest version and how to do that? I have try to install the Digitizer to windows10 but can not installed properly. 2. The only way I can open the Digitizer with my old Toshiba laptop, I transfer the design to the ATP Card ( JAN or JEF ?) , the ElNA 8600 machine not appear the design. Thank you and awaiting for your solution. You should be able to update the version you have but please ask your local Elna Dealer who can make enquiries for you or alternatively call the Software helpline at 1-800-631-0183 Ext 775. They will know for sure but you MUST know the current version you have. Open the software and go to the HELP > about tab at the top and that tells you the version. Or look on the box the software came in or the CD you should still have from when you installed the software on your computer. Yes, the 860 only takes the old style ATA card. It does not have a USB port. So you have to have an old style computer with an ATA card slot so you can save onto it. OR a reader writer box with a USB port for a newer computer. You may call our Software Helpline for further assistance. 1-800-631-0183 Ext 775. The EL860 nees .jef format. Hi, please tell me how format SmartMedia 2MB to my Elna 9010? The manual does not say anything about it! And what file format does this machine support? I am not hugely familiar with that model as it is not one we had in Canada. However, I looked it up online and yes, you can definitely use this CD of designs to stitch out on your machine. They are in jef format. You will just need to get the designs from the CD onto your card to put in the side of the machine. I think you will be OK to put the design inside that folder. Try it. If it reads at the machine, you are OK. The Ord folder is for created stitches in sewing mode. I have and 8006 Elna Envision. I read from the above that I can get new embroidery designs and put them on a card. Where would I be able to get the cards the machine to transfer it? Do I just download the software? I am not familiar with this model so I do not believe it was sold in Canada. I think you can use ATA cards with it but I am not sure. If so, this technology is quite old and almost obsolete so I do not know if these cards and reader writer boxes are available. I know we have none in Canada although you might find something online. I am sorry but I do not have definitive information for you on this machine. Please ask your local Elna Dealer for further assistance in the country where these models may have been sold. Or if you reside in North America, please contact our Tech Support Helpline for further information. 1-800-661-0183 Ext 775.